Brrrr. Here in Canberra it is nearly winter. And time to get the winter woollies out. In late Autumn I busy myself sorting through winter clothes. I try to keep the clothes in my wardrobe, and the kids chest of drawers, focused on what we actually wear. Being frugal, most of my clothes are from op shops, church fetes or gifted (thanks in particular to my sister, whose ’boutique’ I shop at regularly). Yet still I am in the lucky situation of feeling like I have an overabundance of clothes. The boys have less than me, but they still have a lot as well. As I sort through I focus on my blessings. I am so lucky to have beautiful clothes. And to have warm clothes. I give away clothing that I, or the kids, no longer want or need. I am always amazed that when I do this that I tend to get BACK much more than I give away. I also like to focus with gratitude on the clothing that I have, and try to do minor repairs and look after my clothing. Woollens need to be treated with care: hand-washed in a good quality detergent and dried flat. There are many commercial products available, but I like this eucalyptus wool mix, made famous by Martha Gardner. She gave out the recipe freely over the radio over several decades, and many people (including my Nana) faithfully copied it out and used it. Most people prefer to buy the commercial version, but once you know how to make it yourself it doesn’t take much time and saves a lot of money. Try it and you will see. You can make a larger quantity than this, but I find that I don’t need to use it so very much and therefore this amount lasts me around a year. Any more and I find it drying out a bit. But double the quantity if you want to make it in one big batch. The pure soap in this recipe works great with woollens. And the eucalyptus helps to deter bugs and crawlies from eating the woollens. Nothing worse than finding that something else also really likes your favourite jumper that took you months to knit. 1 cake of pure soap, grated (note, many of the cheaper soaps are chemical imitations of soap – pay a little more and invest in the good stuff). Grate the soap. You can do this on the zester side of a kitchen grater, or you can use a food processor (cutting into pieces first). I used a small, handheld, very retro moulinex that I recently purchased from an op shop for $2. The fine setting is designed for grating nuts and Parmesan cheese, and I find that the small shavings are perfect for this recipe. It is also quick and fun to use, and easy to clean up afterwards. My Nana used to combine all the ingredients together at this point and store. If find this works well, but the ingredients can go hard after a while – especially if they are not stored in a container with a tight-fitting lid. A better option is to dissolve the mixture in boiling water. First add the boiling water to the soap flakes, then stir to combine. Allow it to sit for around ten minutes, then add the remaining ingredient. Transfer to a container, and allow to set (it will become all gloopy). To use, take out a small amount (e.g. one teaspoon) and dissolve in a basin of hot water. I don’t think you need to rinse after washing; I generally put it in the spin cycle of my washing machine, allowing a short rinse. I then lay flat until it dries. Cost comparison: 1.25L of commercial liquid, which has been watered down, is around $7.36. I think this is not just cheaper, but better quality as well. Have been meaning to make my own washing powder for ages and am now inspired to get on with it. 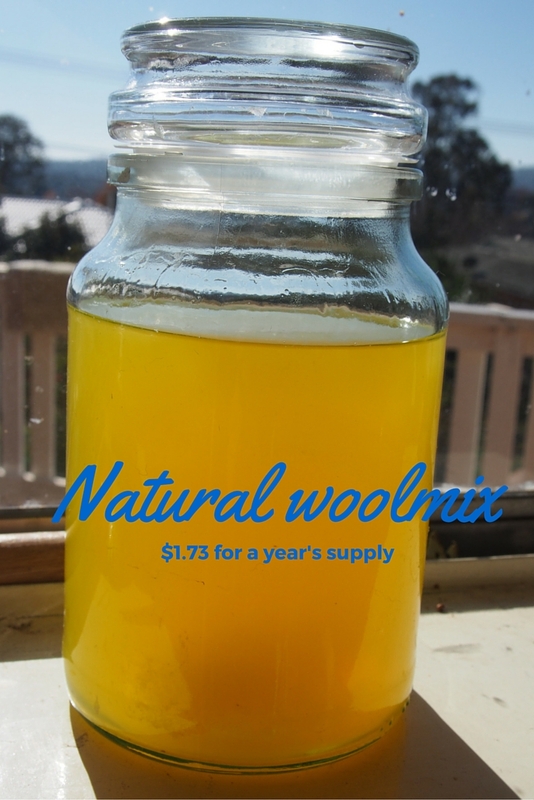 Didn’t know I could make my own wool mix too – thanks! Hi there, I also make my own washing powder. My kids complain about the smell of commercial powders (and they are soooo alkaline). I will blog about my homemade version at some stage. Wool mix is super handy, especially this time of year. The natural soap base really helps to keep woollens in good condition. I think so. Easier to do than you might think.